Hand-grazing a horse is almost hypnotic. We stare blankly at the moving parts and listen to the sound of grass destruction. We look, but how much do we see? Having done this a lot lately, we have come to a few conclusions. Others more than I. Horse shovel the next bite in the front as the previous bite is ground up in the back. If I tried this, I’d be wearing my salad. Alas, I had to have this pointed out to me by a non-horse friend in college. All those years of being around horses trumped by 20 minutes of scientific observation. Mathilda likes low to the ground or the top layer. Not so much the middle. Between the rain softening the ground & M tying up our time, the pasture growth has gotten away from us. She enjoys biting the heads off a grassy, stalky plant that has sprouted (seeded?). This was hubby’s observation. He’s the chef, so he’s used to keeping track of what foods get eaten. They take a bite or two & move on, even if the new grass is of the same type as the old. They don’t settle down & strip an area they way we would an ear of corn. I don’t notice this as much as hubby. I simply stick my nose in a book & follow her about. I’ll look up & think, Hmm how’d we get all the way over here? 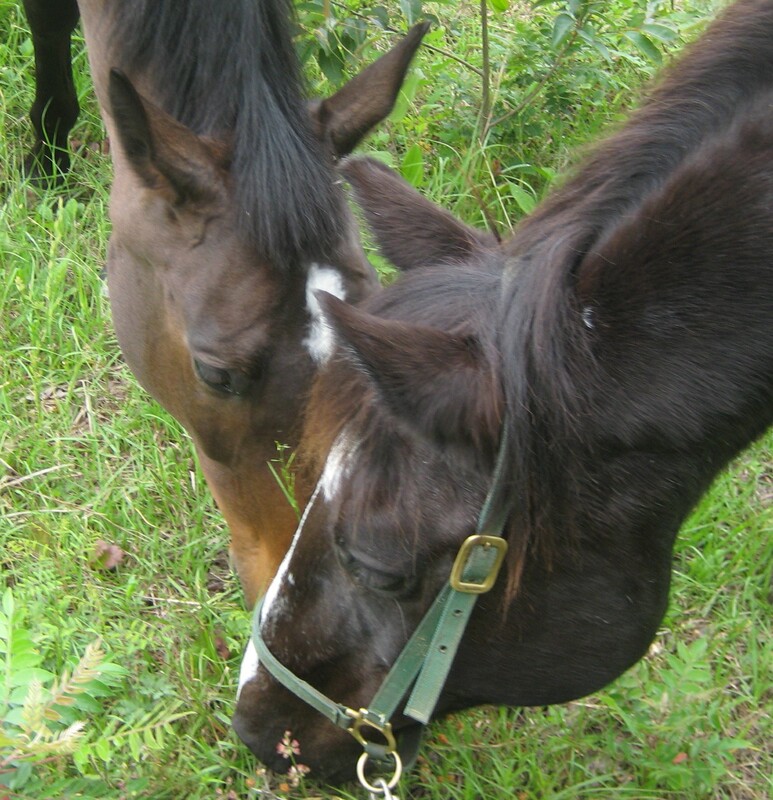 Plus he grazes her first thing in the morning, when she tends to be on a mission. I will watch M tear at patch of grass but leave one undesirable flower/weed standing. How do they manage with those fat noses of theirs? I couldn’t accomplish that with opposable thumbs and reading glasses. 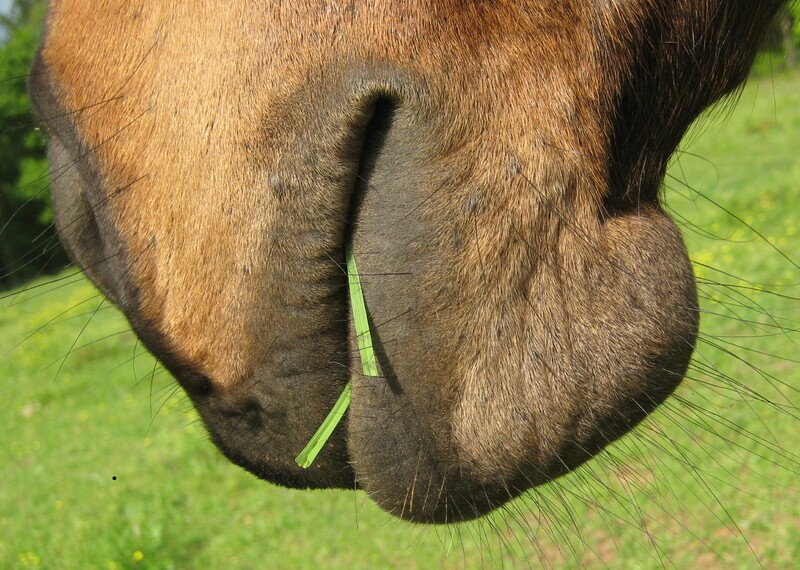 What have you observed about horses grazing? What I find so fascinating about the process is that it is so unlike the way we feed them. I would guess horses pre-domestication (and few feral herds that still exist) spent the majority of their time munching. We feed them two, three times a day and wonder why they colic. I don’t think that’s any kind of a revelation, by the way. Most people who have any sense who keep horses get that we create structures around them that are at odds with the way they live. But a few acres, a run in shed/stall all go a long way to keeping horses happier and healthier. Well-written, informative and amusing. One of the good ones.